ANDRZEJ MROZINSKI* emphasises the need to select the right compaction machine for a good groundwork job. All of the best projects begin with good groundwork and construction is no exception. It is for this reason that compaction is such an important preparatory process, whether building a road, laying a trench or constructing a new building. The aim is to reinforce the density of the ground, whether it is soil or asphalt. However, while the concept of compaction has been a cornerstone of good practice for many decades, the techniques and technology deployed for this function have evolved at a rapid rate in recent years. With an array of options now available, selecting the right equipment for a compaction job is not as simple as it once was, and depends greatly on the type of work being undertaken and the physical constraints of the location. 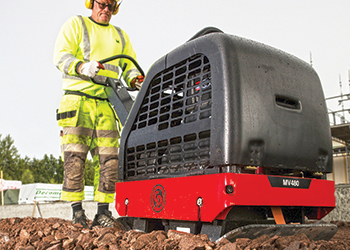 Ride-on rollers remain the preferred option for large and open areas, but in small and confined sites, light compaction equipment is more practical. Easier to manoeuvre and simpler to operate, light compaction equipment can still offer highly effective performance levels, particularly when using the more modern addition of vibration to amplify the force applied by the weight of the machine. For both contractors and rental companies, one of the appealing aspects of light compaction equipment is the lesser requirement for training and licensing for operators, which can have benefits in terms of reducing labour costs. The most powerful alternative to a ride-on roller is a double-drum walk-behind roller, with hydraulic engines providing the necessary muscle to make operation easy and effective. 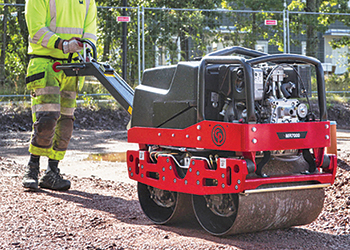 Ideally suited to thin layers of granular soils and asphalt, a well-built walk-behind roller is a true workhorse that offers both forward and backward control and sufficient capacity to limit the need for pauses, therefore maximising productivity. Buyers should look for equipment with a good track record of reliability. In the case of walk-behind rollers, a high quality belt, properly shielded on the side of the machine, will help with longevity. It is important to look for a walk-behind roller with a compact design. With some walk-behind rollers on the market, the housing of the belt drive on the side of the machine extends its width, which may inhibit its manoeuvrability in narrow areas, but a compact design like that of Chicago Pneumatic’s MR7000 makes the machine more user-friendly . However, in particularly confined environments such as trenches, backfills and foundations, a remotely controlled trench roller is often a better option. As an alternative to rollers, a tamper or rammer can achieve a high-impact result. The best tampers on the market benefit from low fuel consumption but still deliver powerful results in even the toughest conditions. As it is handheld by the operator, it is important to look for a tamper that is well balanced for the purposes of manoeuvrability and to minimise physical stress upon the user. Even with superior equipment, however, such is the force applied by a tamper that regular breaks at intervals of 30 minutes are recommended in the interests of the operator’s health and safety. A good quality tamper offers high-impact performance that is ideal for smaller areas. However, the high intensity of the tamper makes it unsuitable for some applications, such as sites where plastic drainage pipes are laid beneath a layer of sand. In this case, the force of the tamper could damage the pipe. The best alternative – reducing both the intensity of impact and strain upon operators – is the vibrating plate, which uses dynamic friction to move particles and thereby increase density. Vibrating plates can be either forward-only or reversible, the latter helping to ensure the correct level of compaction is achieved more quickly by eliminating the need for turning. An additional advantage is that the limited level of vibration carried through to the operator extends the working time to as much as six hours without a need for stopping, which has a significant impact on overall productivity on site. There are specific models suited to either soil or asphalt compaction due to the different requirements, but buyers should look out for a combination of heavy-duty build quality and light weight to balance performance and manoeuvrability. By selecting the most suitable compaction equipment for a particular application, a contractor is better equipped to complete a job quickly and effectively, while minimising overspend on fuel and labour costs. *Andrzej Mrozinski is product manager at Chicago Pneumatic. The company offers a comprehensive range of light compaction equipment including vibrating plates, tampers, walk-behind rollers and remote-controlled trench rollers.